Smooth, salty peanut butter and ooey gooey jelly — what's better than the sweet and savory, melt-in-your-mouth combo of a classic peanut butter and jelly sandwich? For millions of Americans, nothing. It's a great fix when you're on a tight budget and the ideal snack if you're seeking a quick boost of protein, carbohydrates and fiber (if using whole grain bread). Even astronauts think the sandwich is out of this world. While the classic combo has gained enough lunch table credibility to get its own national holiday on April 2, there are plenty of fun spins to inspire everyone to eat like a kid. 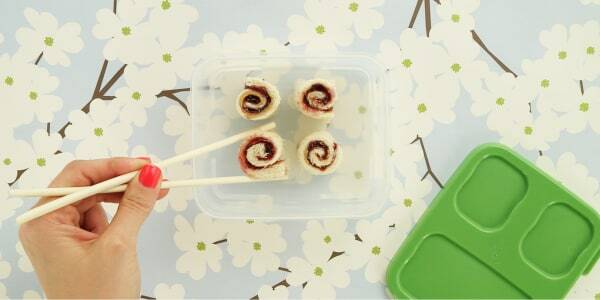 From PB&J sushi to sweet empanadas, here are TODAY Food's tastiest recipes to wash down with an-ice cold cup of milk. Wary of a spicy tuna roll? Start simple with this Japanese-inspired take on an all-American favorite. All that's needed are three ingredients and a pair of chopsticks. 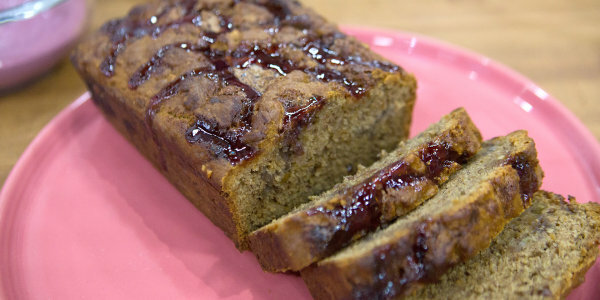 Just when banana bread couldn't get any more appealing, this recipe by Alejandra Ramos came swirling into the kitchen. Use grape, strawberry, raspberry or any other fruit jelly to customize the recipe. Another PB&J mashup by Alejandra Ramos is her version of empanadas. 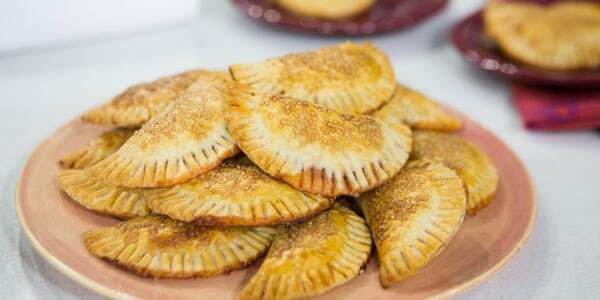 Fun for a party, an after-school snack or even dessert, these oven-toasted empanadas can be whipped up in 15 minutes and are easy to make ahead. Try replacing pie crust with puff pastry for a flakier option or swap the strawberry jam for grape or raspberry. 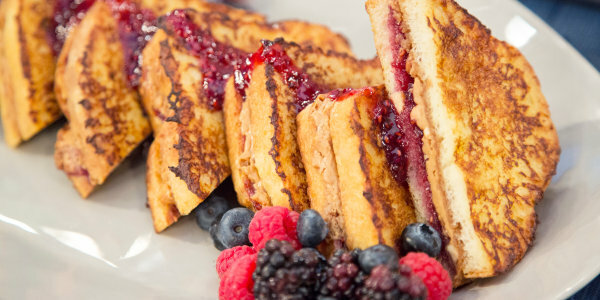 Give breakfast a lunch punch by stuffing warm french toast with peanut butter and jelly. It adds a little extra protein at the start of the day and is beautiful to serve. At first glance, this recipe may sound a little too adventurous. But just go it! This combination creates an amazingly irresistible caramelized crust and the finishing touch of chopped peanuts gives the wings a delicious crunch. 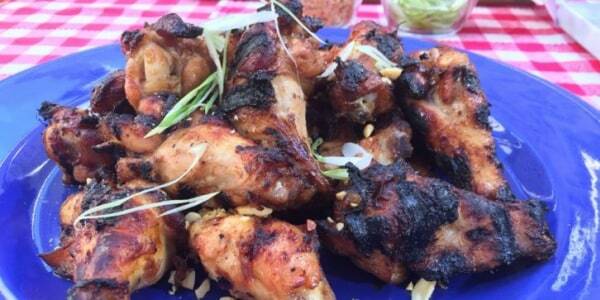 Serve these as appetizers for your next party. 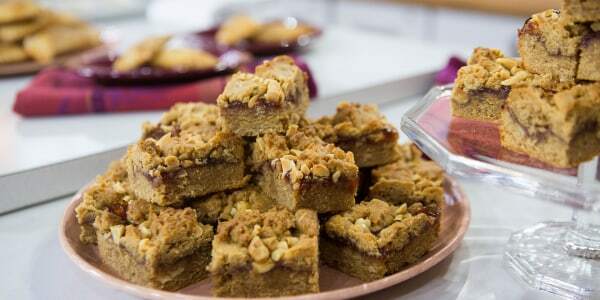 Nothing says breakfast like peanut butter and jelly (peanut butter and jelly breakfast bars, that is). These crunchy, creamy bars will fill you up with plenty of oats and protein. They are the perfect to-go snack or bring-to-brunch dish. Entertaining? Put them out a tray in between big meals to keep adults and kids happy all day. Looking for a quick and clever dessert to make? 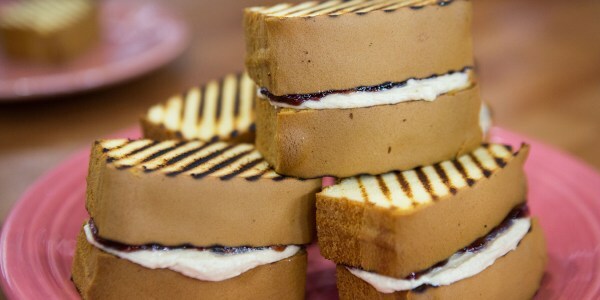 These grilled dessert sandwiches only have a few ingredients and can be ready to serve in 15 minutes. Grilling the pound cake gives it a slightly toasted taste and a slightly crispy texture everyone will love. For added fun and flavor, add freshly sliced bananas or berries.